Hardback. New. Catullus (84 54BCE) couples consummate poetic artistry with intensity of feeling. Tibullus (c. 54 19 BCE) proclaims love for Delia and Nemesis in elegy. 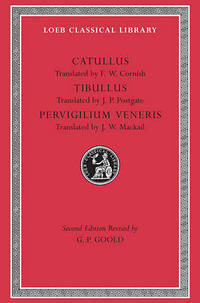 The beautiful verse of the &quot;Pervigilium Veneris&quot; (fourth century CE?) celebrates a spring festival in honour of the goddess of love.